Multitasking – the iPhone 3GS and iPod Touch (3rd Gen) will be able to run multiple apps at the same time. By double tapping the home button, users can bring up a dock which shows currently running applications and switch between them. 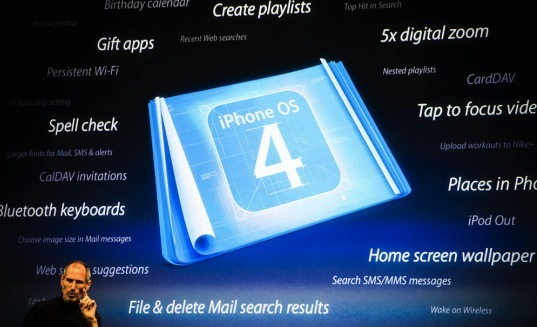 iPhone 3G owners will still be able to upgrade to 4.0, but they will not be given the multitasking feature. The apps are sure to not drain battery life because only certain functions of the app are left running, and entire apps are able to freeze themselves instead of running full steam ahead without you knowing. iBooks – iBooks will be coming to the iPhone and iPod Touch with the same look and bookstore as are on the iPad. Books can also be synced to your computer back and forth between mobile devices – so you don’t have to re-download them. Custom Backgrounds – Users can now set a home screen background like the iPad. Game Center – Apple will attempt to “power up” it’s market-share on gaming by giving users a centralized game center, similar to PSN or Xbox Live, called “Game Center”. It’s a mystery as to what will happen to apps that already perform this funtion, like “Open Feint”. iAd – Users will no longer be annoyed by links in apps that lead them outside the app. Instead, Apple’s new “iAd” platform will use new tools to push interactivity and emotion to the max, and give users an enjoyable experience in advertising WHILE keeping them in the application. It’s in the OS Dev Tools, but is not necessarily a part of iPhone OS 4. App Folders – Instead of having multiple home screens (topping out at 11), users can categorize their apps into folders. Now users can view over 2,000 apps, instead of only 11 home screens. The update will be available for iPhone 3GS, iPod Touch 3rd Gen. during the summer. The iPhone 3G and older iPod Touches will get the update, but not the multitasking feature. And what about the first iPhone? It seems it’s now an unsupported update product, much like Tiger. You can still use it, but it will never receive the update. The iPad will get the update sometime during the Fall. Yes, it was a good keynote by Apple, but more announcements were made today that answer some questions asked on Monday. To start, Snow Leopard is completely ditching the PowerPC chip. Intel chips are now a requirement to run OSX 10.6. It will also give all multi touch trackpad equipped notebooks full support for 3 and 4 fingered touch gestures. Secondly, AT&T has confirmed that they will support tethering, although we don’t know when. It would have been nice to see them in the Keynote presentation, but they’re always behind. The “Find My iPhone” feature of Mobile Me is also live now, and working as planned. This also comes with the announcement of a free “iDisk” app that will support all your documents and give you the ability to view your Mobile Me iDisk on your iPhone, giving it a small version of a file system. The iPhone 3G S also has a fingerprint/water and oil protected screen, which only needs a dry cloth to clean it, reducing the risk of water damage. A bit of bad news however: iPhone 3G only supports Open GL 1.1, while the new iPhone 3G S supports 2.0. This leads to questions about the app store dividing into split sections, along with the fact that the new iPhone has a 600Mhz processor and 264 MB of RAM. Apple says that you can always develop GL 1.1 to support all touch devices and not just 2.0. -Jon Rubinstein has taken over as CEO of Palm, officially making it the anti-Apple. And lastly, a bit of advice from Jesus Diaz over at Gizmodo: AT&T is right about charging full price, because they are already giving us discounts, and it’s not like the economy is great anyway. Have an iPhone 3G? Does it work? Then take advantage of the speed boosts in the free iPhone 3.0 update next week, and be happy with it, because it will save you more than a few hundred dollars. To start of the day, all the Apple fans who have been hoping to get a Mac tablet can now build one themselves. The iTab was constructed by fusing together a Macbook with an Intuos Tablet—Wacom’s mid-level tablet offering—and a repurposed LCD screen. Check out his full blog at Introducing iTab [weistudio]. Nano-with a built in camera. The iPod would be held sideways just like any other camera. We can hope that it’s a little more than 2 mega pixel. For the developers out there, Alex Cone, CEO of CodeFab Evolution will be hosting an iPhone Boot Camp Programming Class at the “iPhone Mansion”. The class will run from June 6-8 and offer 24 total hours of instruction from 10am to 6pm each day (classes start a little later on the 8th to make way for Apple’s introductory keynote). Mentioned topics will start with the basics of iPhone coding, then go into advanced techniques, including sample code and exercises. Along with that, lunches, refreshments, and drinks will be provided, and the location is a 10-minute drive from the Moscone Center in downtown San Francisco where WWDC will take place. Each night there will be an iPhone Nights @ the Mansion event that is open to 25 public seats at $10 a head. Each of these events will feature key speakers like App Store staff and iPhone app investors.The iPhone Boot Camp San Francisco daily classes have only 15 seats. Early bird pricing (before May 30) is $1,499.00, while regular price up to the day the classes start is $1,699.00. Students with a valid ID and school e-mail address can grab tickets for $1,299.00. TV, the supposed iPhone download service for videos. It doesn’t seem like a very clever name considering the fact they have a product with TV in it (Apple TV), and that many people could mistake it for TV shows only. Lastly, two icon place holders have been found in the latest version of the iPhone SDK. Two place holders currently exist: “iPhone 1,1” which indicates an 8GB iPhone 3G, and an “iPhone 1,2” which would indicated a 16GB iPhone 3G. The other two placeholders are titled “iPhone 2,1” and “iPhone 2,2” which have no physical change of appearance, but seem to hint at a new iPhone coming up with hardware improvements. And to end on a happy note, this month’s New Yorker has chosen it’s cover to be a piece of artwork done completely on a $5 iPhone app. AT&T has started selling refurbished iPhone 3G’s for only $149. What’s even better is that these are the black and white 16GB. Getting an iPhone for this price with a 2 year contract is a steal! Oh wait, there’s always the data and voice plan. Apple just reported a $1.21b profit on revenues of $8.16b, which sets another record for Apple. Mac sales did fall three percent compared to a year ago, but that was offset by a three-percent increase in iPod sales and a 123-percent jump in iPhone sales. In fact, AT&T has activated 1.6 million iPhones since last quarter! Meanwhile, rumors have sprung about Macbook updates that could happen at WWDC, like built-in 3G, minor firmware upgrades, spec bumps, and serious program updates, for the more professional level such as Final Cut Pro, Logic, Shake, and Aperture. (Possibly Apple Remote Desktop 3.1). This picture is completely true. This interface appears in iPhone’s SDK when certain commands and API’s are activated. The video app, same as the camera, uses a small switch to toggle camera and video modes. The snap/record button and library button change respectively. Also to be in iPhone 3.0 is image stabilization, auto-focus, and voice-dialing.